You know where your food comes from, but do you know your farmers? Join us to learn the stories behind your local farmers and food producers. Our goal is to inspire New Orleans residents to grow their own food while celebrating the efforts of all kinds of growers and makers: backyard and container gardeners, urban farmers, community gardeners, and food producers. What does Why NOLA Farms do? We do our best to keep up with all of the urban farming and gardening events in the city and maintain a community events calendar—however, new farms and gardens amazingly keep sprouting up (pun intended) every month that we may have yet to discover! There is a map of NOLA public farms and gardens that is in progress. We cover local farm news and write farm profiles, along with the occasional local food recipe. Every June, Why NOLA Farms teams up with the NOLA Social Ride and NOLA Locavores to put on free urban farm bike tours for the New Orleans community as part of the Eat Local Challenge. 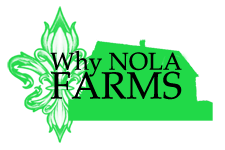 Who is Why NOLA Farms? Both of Lisa’s parents grew up on dairy farms in the fields of rural central Minnesota. She grew up playing in the hay stacks in the barn, and looked forward to visiting the chickens, cows, dogs, cats, and her grandmother’s giant garden. Despite her family’s history, Lisa first discovered her love for vegetables and healthy eating while living in Benin, West Africa, where processed food products were rare and she learned to prepare all of her meals from scratch. Lisa previously worked as a vendor for a local food producer at the Crescent City Farmers Market, where she had the privilege to get to know other vendors and hear their stories. As a volunteer and long-time rider with the NOLA Social Ride, Lisa became involved with organizing the Urban Farm Bike Tours for the Eat Local Challenge each June, and during the first year she realized just how many farming projects were happening around the city and discovered that her enthusiasm for supporting local farmers didn’t end at planning the rides. Lisa grows food in containers from her balcony. Adam originally hails from Toledo, Ohio. 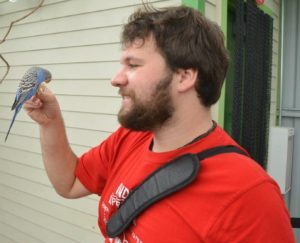 He enjoys riding his bicycle and leading the occasional Happy Thursday NOLA Social Ride, taking photographs for his friends, and supporting local farm events. Adam previously grew vegetables in a tire garden and hopes to grow food once again when he secures a yard.